Mucus coats nose, throat, intestines, stomach and airways to prevent bacteria and viruses from moving further into other parts of the body and causing infection or illness. Sometimes the body will produce more mucus than normal or the mucus will become thicker as the body tries to expel irritants, viruses or bacteria. When the mucus drips out of the front of your nose, or runs down the back of the throat, it is called post nasal drip. Read on to know the symptoms and causes to adopt proper remedies. 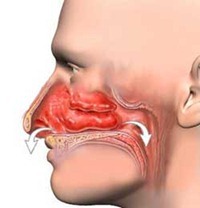 Colds, the flu, persistent sinus infections and allergies can all lead to post nasal drip. Medications, like birth control or high blood pressure medications, are other common causes as is pregnancy, weather changes and spicy foods. Those with a deviated septum or other problems with the nose structure will experience post nasal drip since nasal issues can directly affect the sinuses. Certain fumes, like perfumes or cleaning supplies and other airborne irritants can also be the causes. With post nasal drip it is also possible that the problem is not too much mucus, but that the mucus is not being cleared away properly. Problems with swallowing can cause a backup of mucus, thus become post nasal drip. This can occur as a result of age, blockage or even reflux conditions in the stomach. Many of the problems associated with post nasal drip, although irritating, are minor and will go away on their own in a few days. The following remedies may help you ease or even eliminate these symptoms. How you treat post nasal drip depends on what the cause of the problem is and what symptoms you are suffering from. Decongestants or antihistamines will help. You may need antibiotics, although if the post nasal drip is due to a virus antibiotics will not work as only bacterial infections respond to antibiotic treatment (viral infections do not). All medications can have side effects so consult a doctor or pharmacist before deciding which remedy to use. Give your body a helping hand by thinning your mucus. When you are dehydrated, saliva becomes thicker and sticky, causing mucus to thicken. So, the simplest way to thin mucus is to drink lots of water and keep the body hydrated, making it been expelled by the body more easily. You can also use vaporizers or humidifiers, nasal sprays and medications like Mucinex. In order to reduce risks of post nasal drip it is important to minimize allergy triggers. Using dust proof covers on pillows and mattresses can help, as well as washing your sheets, pillowcases and mattress covers as often as possible and in hot water. Dusting and vacuuming regularly will reduce allergens in the air as well as the use of special air filters in your home. Gargling salt water can help alleviate symptoms in the meantime. Add 1／2 of a teaspoon of salt to one cup of water and gargle with your head leaning back so that the entire throat area is coated. You can try this as well: Mix a teaspoon of a salt and a pinch of baking soda into 1 cup of warm water. Put this mixture into a nasal syringe then squirt it into your nostril keeping the back of your palate and throat closed. Tilt your head in all directions so that the solution can reach each sinus cavity, and then blow your nose. Repeat this process a few times in each nostril. Keeping your home’s humidity relatively high can help remedy post nasal drip. Keep a full kettle on low boil or use a humidifier (be sure to keep the humidifier clean to avoid problems with mold). Avoiding areas that are known to have dense smog will help, as smog is a known irritant. Cut back or stop smoking and avoid exposure to secondhand smoke. The steam and humidity from the water temperature will help to clear passages and thin out mucus. Facial steamers or boiled water held close to your face can work wonders. Adding small amounts of salt, eucalyptus, mint or ginger can help make the steam bath more effective. Plant extracts are also helpful as treatments. Cinnamon and thyme can be used to alleviate irritation and inflammation. The antioxidants and antimicrobial properties help to improve your body’s immune response. If the drainage has a bad smell, you are running a fever, wheezing, or any symptoms last for more than ten days, you must consult a doctor. These are all signs of a bacterial infection and will need to be treated with antibiotics. Also consult a doctor if there is blood in your drip and if medication isn’t helping as it is supposed to.